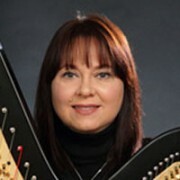 Martha Waldvogel-Warren holds a Bachelor of music in Harp Performance from Ball State University with Elizabeth Richter, and a Master of Music from the Cleveland Institute of Music with Alice Chalifoux. Further studies have taken her to the east coast at the Salzedo Harp Colony in Camden, Maine and the Tanglewood Institute in Lenox, Massachusetts where she studied with Lucile Lawrence. Extensive performance experience in orchestras and chamber music ensembles in the US and Europe, as well as solo appearances worldwide round out Mrs. Waldvogel-Warren’s resumé. She has produced four CD’s: a trio with Swiss flutist Paul Haemig and Actor Johannes Meier reciting poems by Herman Hesse, two duo CD’s with New York flutist/piper Christopher Layer featuring both classical and folk music, and one solo CD. Having returned from living in Switzerland in 2007, she brings back a wealth of teaching experience. Her students from Musikschule Kloten/Zurich combined with students from her private studio have given her an opportunity to form and lead several harp ensembles.